Charlie Brown Photography latest shots of the awesome Crawling track in Belleview,FL at the RRW Hobby Shop & Track. I was invited to come check out this awesome man made crawling track of obstacles and fun. The group that goes by the name R/C Freaks was doing practice runs and modifications to the track and all pitching in on some clean up and fun testing out the layouts. Here is a few shots that we were able to get of some of the crawlers rigs while we were there today! Here Is some awesome photos from Charlie Brown Photography and our session with Amber Autumn and Lead photographer John Sloan Portraiture. I was lucky enough to have a awesome shoot in Gainesville,FL double shooting with my good friend John Sloan. Amber Is a very talented Ballerina that attends Cameron Dance Center in North West Gainesville,FL. These shots that we got from Saturday afternoon were just stunning different side then the normal Ballet photos your use to seeing. Here is a few behind the scene shots I was able to sneak in while waiting for my turn to take shots with the beautiful Amber Autumn. Charlie Brown Photography is pleased to announce in the citrus county and marion county and surrounding central Florida areas that we are now offering a custom tailored home decor photography product and service line to our Charlie Brown photography business. What that means is we now offer photos/images of places or objects to your local and non local area that we have or can photograph for you to create stunning wall art decor in your home to fit and match your already "Themed" decor setup and organized in your home. We will offer canvas prints, metal prints, acrylic prints and our recently added Glass prints! 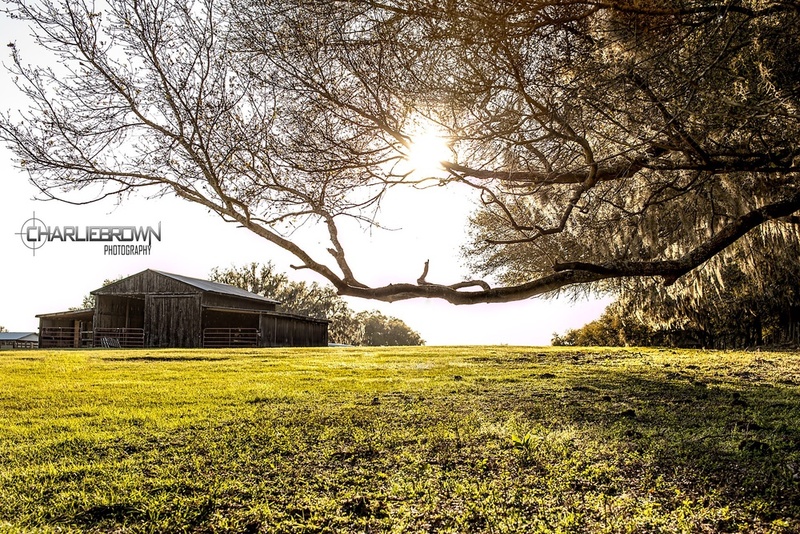 imagine a stunning photo like this for your western or log cabin home of a peaceful sun setting photography of a old horse barn in a big open field hanging over your fireplace as the center piece to your living room or sitting area. The photo above was taken in Dunnellon,FL setting up a shot for a engagement session on this old farm land. Unlike our normal sessions we offer this home decor service in a unique way! There's no session fees to be covered at all, just paying for the print that simple. For more information go to our contact page and send us a email or call us and we will be glad to answer any of your questions or setup and sit down meeting to discuss our different collections of full home layouts for your wall art needs. Here is a preview of the engagement session by charlie brown photography of Hillary and Brett in Dunnellon,FL right next to our Citrus County location. This was a very fun and beautiful engagement session for this couple, at there grandmothers home/farm with a very rustic and beautiful horse barn as the key center piece to these awesome engagement portraits we took from that day. Also enjoy the little peak at the behind the scene shots of Charlie Brown Photography in action! Beautiful sunset dropping just over the old wooden horse barn. 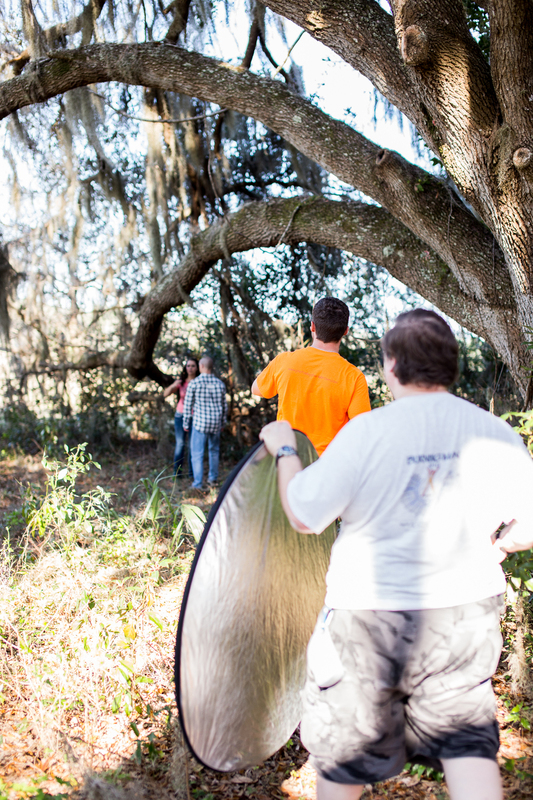 Here are some behind the scenes photos of Charlie Brown Photography in action on Engagement session in Dunnellon Florida.